So by now you’ve probably seen a few posts about the meet-up in Birmingham this Saturday. It was the first one I’ve attended, so I wasn’t sure what to expect but I was fairly excited to finally meet some of the people with whom I’ve been conversing via tinternet since starting this blogging adventure. I was planning to drag Daughter No1 out with me, mum-daughter quality time. Daughter No1 & I arrived late at New Street, thanks to London Midland not having proper staff or facilities at their Selly Oak station. But we were determined not to be down about it and headed to Fancy Silk Stores hoping to catch up with “a large group of ladies clutching armfuls of fabric”. We didn’t see them at Fancy Silks, that’s because they started at Barry’s! Not deterred, we found stuff we wanted. We found the most devine black wool crepe which will be a Gabriola for the winter for Daughter No2 – a specific request. 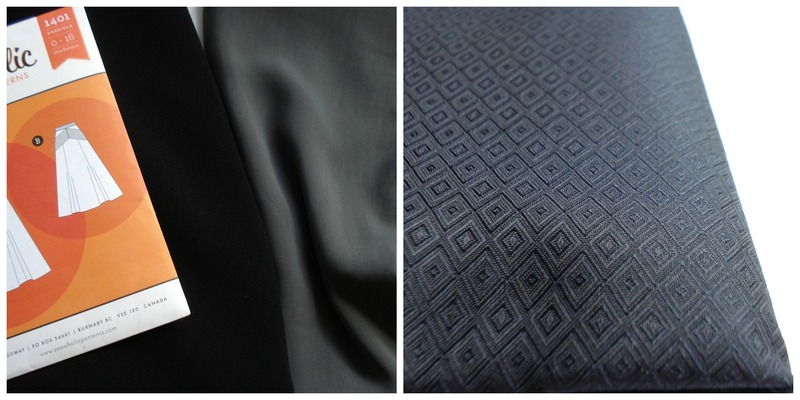 The grey polyester has the most amazing drape, it feels like washed silk – now that’s what I want to buy! I’ll make an All Saints type draped blouse for Daughter No1 with it. The black silk jacquard is for a vintage dress for Daughter No1. On the way out we were met with the ladies coming in from Barry’s, but we needed tea – and lunch. Our go-to place for lunch is The Handmade Burger Company. We met the group again at 1pm to get the bus to Moseley & Guthrie Ghani. We left our bulging bags upstairs with the tea & cakes & headed into the shop to see what treasures were inside. There was a decent amount of fabric, lots of quilting cotton stuff. We ended up with a remnant piece of jersey – another Maria Denmark Day to Night top & two pieces of cotton. The shop also had the largest range of independent patterns I’ve seen in one place. 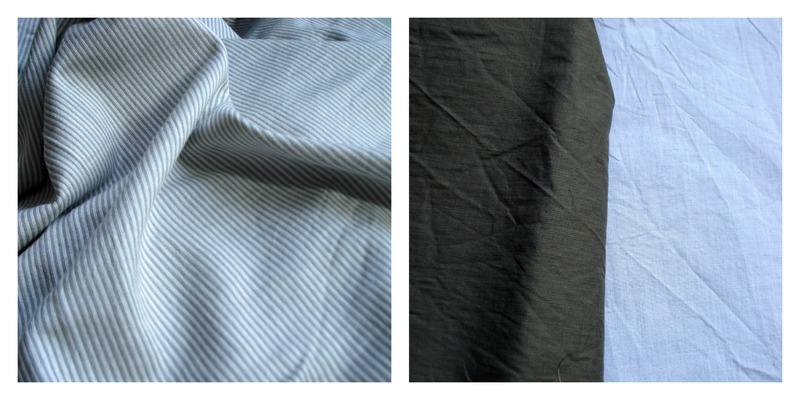 Fabric from Guthrie & Ghani, grey & white striped jersey and two weights of cotton. It was great to see so many sewists all together, but there was one problem, I didn’t have a clue who anyone was! I managed to discover Claire from Sew, Incidentally who I follow on Twitter and met some new people too, Amanda, Ann & Toria. I have to add here that Daughter No1 was far better at starting to chat to people than I! The fabric & pattern swap was interesting, more of a free-for-all than I had expected! Nontheless, I managed to get rid of all the patterns I took (& I took a fair few) and come home with a couple of new-to-me ones. I only got rid of 1 piece of fabric, but brought 3 home! I’ll dye the green satin backed stuff, the metres of burgundy jersey will be dresses & tees for Daughters No 1&2 & I also got a piece of black jersey, not photographed. That’ll be a Renfrew for daughter No1. So I have my work cut out for me with all these new goodies added to my already overflowing stash boxes! I will probably get the black jersey from the swap & the grey & white stripe jersey made up first as they’ll be the quickest. The toile for the 60’s dress is under way so it’ll be a tousle between making that dress or the black crepe Gabriola next! I thoroughly enjoyed the meet, my feet hurt, I was desperately short of tea & my arms were a good 5cm longer by the time I finally made it home, but it was so worth it! Thanks Charlotte from English Girl at Home for organizing it all & to Lauren for letting a hoard of fabric-aholics into your shop! Definitely need to meet in person! 🙂 I’m really itching to get started on making, first I need to make that dress, then maybe the drape tops followed by the Gabriola. A black wool Gabriola. Perfect. And elegant. 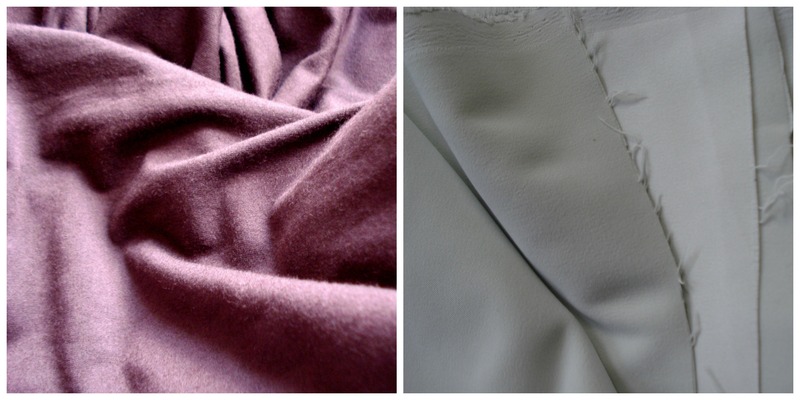 I agree with you about the poly grey: a good poly crepe should feel and handle like silk. And that silk jacquard is just gorgeous. Well done on the shopping front! I think I was the one who got that lovely purple chiffon? You daughter didn’t even had the chance to put it on the table 🙂 thanks so much for it. I think I will make a dress out of it next summer.